CardioReportware | Cardiology Software for Hospitals, Clinics & Private Practice | Nuclear, Echo, Stress & Web Modules | Nicomac Systems Inc.
CardioReportware is designed to help you deliver high quality cardiac service and care to all your patients throughout your entire work day. 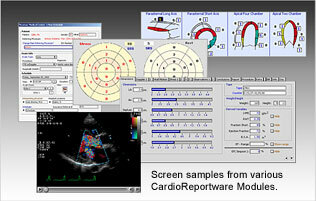 CardioReportware™ is an easy-to-use, fast, flexible cardiology software for report generation and revenue collection. It streamlines the collection, analysis, reporting, archiving, and maintenance of a lab's echo database.